If you haven't taken your camera out at night, check out this article from Picture Correct and see how you can take some great shots at night. Taking night shots is not as difficult as some may think. If you have a camera, a tripod, and a subject you can take some great night shots. That is, as long as there is some light available. It can be artificial light, moonlight, or ambient light from the atmosphere just after sunset. If after reading this article you wish to take your night time photography to the next level, have a look at this book. Night photographers have one big thing in common: a true love of the dark. Rather than looking at night photography as an extension of daytime shooting with added complications, they embrace the unique challenges of nocturnal photography for the tremendous wealth of creative opportunities it offers. If you have some experience with photography and have always wanted to try shooting at night, you'll learn the basics for film or digital shooting. If you're already a seasoned pro, you'll learn to use sophisticated techniques such as light painting and drawing, stacking images to create long star trails, and more. 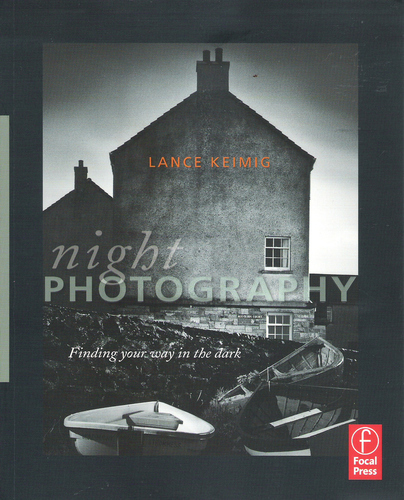 A chapter on the history of night photography describes the materials and processes that made night photography possible, and introduces the photographers who have defined night photography as an artistic medium. A chapter on how to use popular software packages such as Lightroom and Photoshop specifically with night time shots shows you how to make the final adjustments to your nocturnal creations. In this book you'll find history, theory, and lots of practical instruction on technique, all illustrated with clear, concise examples, diagrams and charts that reinforce the text, and inspiring color and black and white images from the author and other luminaries in the field, including Scott Martin, Dan Burkholder, Tom Paiva, Troy Paiva, Christian Waeber, Jens Warnecke and Cenci Goepel, with Foreword by Steve Harper.